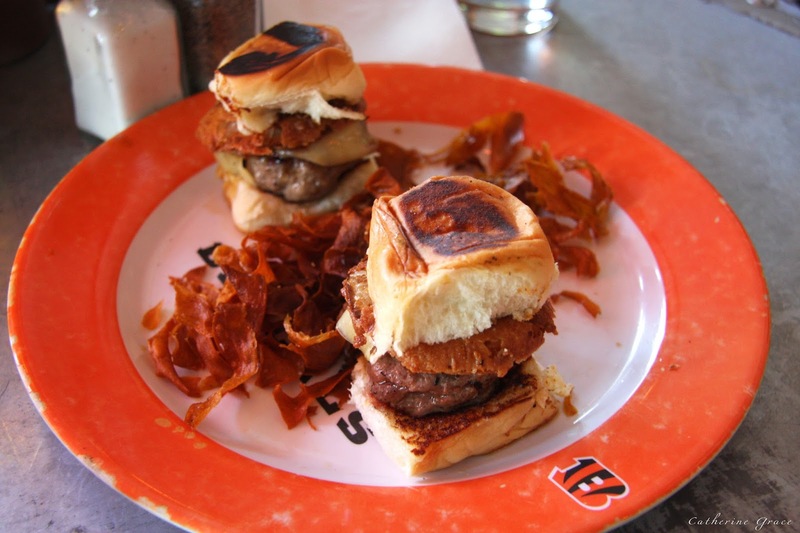 I had the pleasure of trying the new Baby Blues Happy hour menu that just launched. After trying a bunch of items on the happy hour menu, I must say this is one of the best happy hours offered in Los Angeles. It was very unique and different than I thought it was going to be coming from a traditional BBQ restaurant. I was pleasantly surprised, or rather blown away by how amazing everything was. You really get 5-star quality food for a happy hour price. Check out my experience from the beginning to the end! LOOKING AT BABY BLUES NEW HAPPY HOUR MENU DECIDING WHAT TO TRY FROM SO MANY GREAT OPTIONS! Popcorn is one of my favorite snacks. I’m a salty gal over sweet, and this was the best starter to munch on with a couple of beers before the food came out. 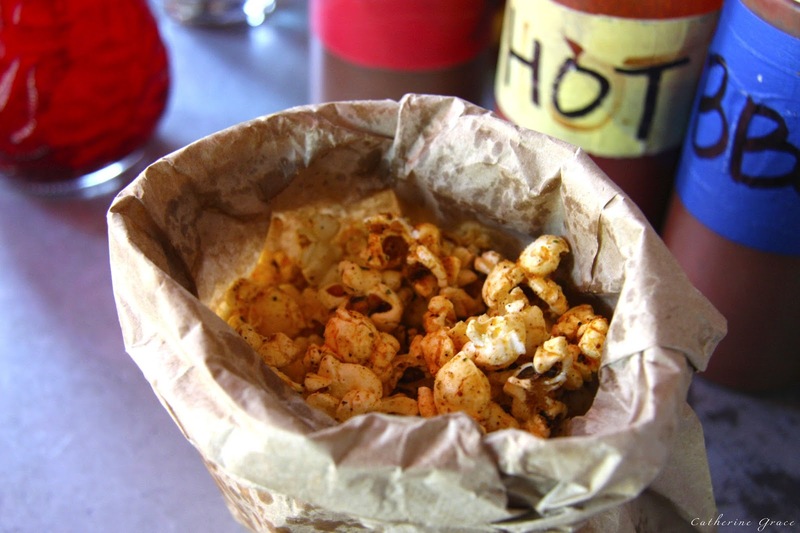 The seasoning is their dry rub that they use for their meat, which truly made this popcorn unique- it added the perfect kick of spice. Instead of a heavy bread basket, this was the perfect introduction to what was to come. Rolled in cornmeal batter and deep fried to a perfect golden brown, this felt like good ol’ state fair food lol. The beef link had a spicy kick to it which I liked too. I took my friend from Virginia with me who is a crab cake pro lol. She knows a good crab cake, and she gave these sliders major props! These crab cakes are the real deal. They are made with fresh, lump blue crab meat and they were delicious. Some crab cakes have too much mayo, or made with more of everything else but crab, but this was ALL good quality crab that was seasoned great with a hint of lemon flavor. The chipotle remoulade gave it a creamy texture which I loved. Perfect little sliders, and to get good crab for $5, you can’t beat that! These sliders were so good! I usually don’t like warm pineapple on any food, but this worked so well mixed with the salty fried onion. It was a sweet & salty combo which I love, and the beef was tender and had great flavor. Very unique sliders! This was something special. When I said 5 star quality food for a happy hour price I was referring to this. I had never tried bone marrow before, and this was the best first experience at Baby Blues. I am usually turned off by just the “gamey” meat smell of bone marrow, but this dish was so perfectly executed. The bone marrow tasted like the flavorful fat on a good piece of meat- it was like fat jelly on toast. I know it sounds weird, but fat is so flavorful and the lava salt on top gave it the perfect seasoning, and the buttery, toasted bread was the perfect platform for it. The combination of all three was meant to be- it all worked. The flavor was incredible.Highly recommended! Another favorite of the night. Simple, but delicious. I think it was the best artichoke I ever had. Usually an artichoke is served plain & just steamed, but this was steamed with orange, lemon, and peppers brushed with a garlic and olive oil rub which made it extra tasty. I will definitely be ordering this again! Baby Blues is known for their meat so this was obviously good. The teriyaki salsa gave it a unique, sweet twist to your traditional beef skewer. Well done! Fresh Atlantic salmon that is cured in a special blend for two whole days! Another fine dining dish in my opinion. The salmon melted in your mouth and it had amazing flavor. The toast was buttery & crunchy, and the salmon was “silky” tender. It tasted like good salmon carpaccio. The creme fraiche added a creamy texture which pulled it all together. Once again, all the flavors and textures blended just right to make the perfect bite. I was so excited to try this when I saw it on the menu! The candied jalapeno made it sweet AND spicy, and the glaze tasted tangy/sweet. The bacon added saltiness to it too. Lot’s of flavors going in in such a small bite lol. Thumbs up! BIG THANKS TO RICK MCARTHY (Baby Blues owner) AND DANNY FISCHER (Baby Blues owner/chef) FOR HAVING ME! EVERYTHING WAS DELICIOUS! As you can see this is quite the happy hour. Enjoy Baby Blues Happy Hour from Monday through Friday 4pm-7pm. I had such a great experience. I can’t express enough how amazing every dish was and I can’t believe how cheap it all is too. You must experience it for yourself! Thanks again Baby Blues!